Many years ago, the majority of clothing that Americans wore was actually made in America. Today, only roughly 3-5% of clothing is still manufactured on our shores. Most of what Americans buy and wear is inexpensive, mass-produced clothing that might last one season. And while inexpensive clothing fulfills a desire for trendy selections or a laissez-faire attitude about our wardrobe, it has a true economic and environmental impact as well. Millions and millions of pieces of cheaply made, “disposable” clothing end up in our landfills every year. We believe that the alternative to cluttering and expanding our landfills in this way is to invest in well-made clothing that will last. Clothing that can withstand fashion whims and foibles, but can also withstand solid use and care. St. Croix Founder, Bernhard Brenner often says that with regular, normal wear and care, a piece of St. Croix knitwear can literally last you 40 to 50 years. These are the sweaters and garments that can even be passed down and begin a fresh life in the hands of someone new. And the peace of mind knowing that your clothing is going to look as good the first time you wear it as it does the 200th time is worth something. A classic, V-neck wool St. Croix sweater? It would look as perfect on, say, Cary Grant as it would on Adam Levine. Tried and true sage advice, like “you get what you pay for” persists because it does ring true most of the time. There will always be exceptions, but for the most part, cheap clothing is just that—cheap. 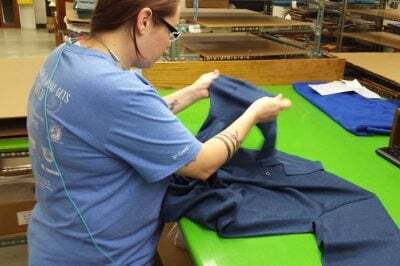 Big box retailers know that buying in large quantities will drive prices down, but in order to offer clothing at rock bottom prices, corners need to be cut in the manufacturing as well. There’s just no other way to produce items inexpensively. Everything is impacted: the design, material, manufacturing and finishing. By sharp contrast, St. Croix Collections is the exact opposite of that approach. Painstaking work goes into every aspect of our development process, from initial trend research and design, all the way through the manufacturing process of not only the fabric, but the garment, through to final inspection and packing. Every single step along the way has a finely honed process and requirements, developed with commitment and attention to detail over the last 50-plus years. Let’s look at just some of those processes in greater detail, so you understand exactly what you are getting when you buy St. Croix knitwear. There’s just no substitute for doing your own research, as Mr. Brenner and the Design Team will tell you. While they subscribe to the classic industry research, they also believe in doing their own legwork—literally. Miles of walking take place at least twice each year with research and design trips to all corners of NYC and Europe, seeing emerging trends and gathering inspiration personally. American design with European influence is how we think of our style. And that’s why we offer classic pieces that can legitimately be in your wardrobe for 40 years as well as innovative and unique designs that keep our collections timely and interesting. Our development process is no less intense. 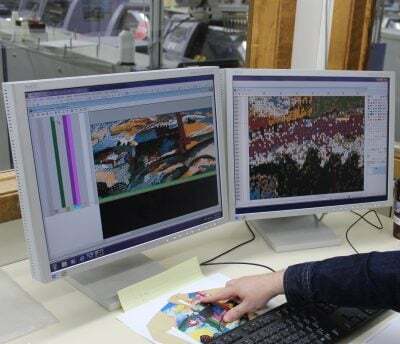 Whether the garment has an intricate pattern design or a specialized stitch design, everything is plotted into our weaving systems, using the latest technology both for the pattern development but also the knitting. St. Croix has been using STOLL knitting machines since our inception, because they are the best. It would be hard to create a long-lasting garment if the foundation isn’t solid, which is why so much time, effort and resources are spent on the front end of every piece of clothing. We use only the best. It would be ludicrous to do anything else because we know that better quality materials inherently make our products last longer. We refer to ourselves as a “natural-fiber” mill. We use Egyptian Cotton and Merino Wool as our main yarn types, adding in other exclusive and hard to find luxury materials (like silk and cashmere). Both the Egyptian Cotton and the Merino Wool are produced/grown/reproduced on nature’s cycle of life. It’s a beautiful co-existence of man and fiber that has been used since the beginning of time. Wool is such a wonderful natural fiber and has properties that are not found in other fibers, such as the ability to wick away moisture. Ecologically, this natural product does not “use up” any natural resources and may be easily reproduced. And at the other end of its life cycle–it breaks down faster than any synthetic fibers such as nylon and acrylic, which is a good thing for the planet. Once in the landfill, it’s estimated that it takes 30 to 40 years for nylon to break down, as opposed to 1 to 5 years for wool. And it’s not just any wool that goes into the knitwear at St. Croix. Only the finest grade. If you have the opportunity to get a tour of the St. Croix facilities from Mr. Brenner himself, you’re in for a treat. He’ll walk you through the entire process, and while educating you and charming you with his wit, you’ll finish the tour wondering how anyone could ever buy anything except St. Croix. 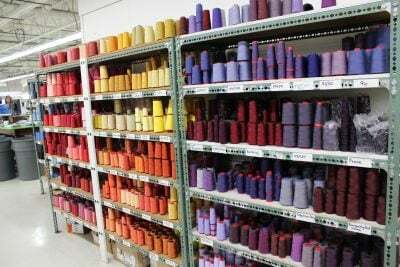 At one point along the tour, you’ll see the cones that contain the dyed fibers we use to knit our fabric. Mr. Brenner will pull out a cone, and take one strand of fiber from it, and lay it carefully on a piece of paper. Next he’ll ask for someone to contribute a strand of hair—just one—and lays it next to the fiber. Every time, the fiber from the cone is nearly impossible to see when compared to a single strand of human hair—the material is that fine. By the time that ultra-fine material is woven into enough fabric to create our garments, you can imagine the strength and luxury that the finest raw goods in the world provides. In fact, it takes over 31 cones set up over 4 knitting machines to create enough components for just one classic V-neck sweater. There’s no cutting corners in that investment. It’s worth noting that before our fabric even gets into the hands of our artisans, it goes through a specialized process. But no chemical processing—our fabric is all washed, steamed and dried, extending the lifespan of the finished garment by eliminating shrinkage, improving the washability and helping the garment keep its shape. It’s amazing how often you purchase something that wasn’t pre-shrunk and it becomes at least a size smaller than its original size after the first wash.
Once in the hands of our highly skilled craftspeople, the garments really start to take shape. True to form, no corners are cut in this process either. In fact, it’s exactly the opposite. Most manufacturing processes rely on industrialization to help speed things up. Performing tasks mechanically, in multiples, helps cut down on the amount of time it takes to complete one product, and therefore, decreases cost. At St. Croix, when we say our garments are made by hand, that’s exactly what we mean. Just watching the beginning phase where the patterns are laid out (by hand), marked (by hand), and cut out (by hand) is an impressive sight. Giant shears are used to cut out some of the pattern components. It feels like a throw-back to the way things used to be done, and more resembles a custom tailoring shop instead of a manufacturing step. Once all the pieces are cut, they are passed among the many hands of the all the sewers. Each person has a specialized skill that they rely on to complete each garment. A highlight is watching how the collars and trim are attached to every piece of knitwear. 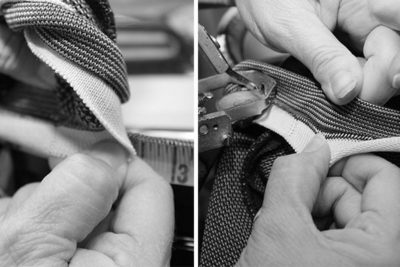 We use a specific process called looping (or hand linking) that allows the trim to stretch with the garment. When not put together in this way, threads break along the trim when they are stretched, and it ruins your clothing. That simply doesn’t happen with St. Croix. Attaching the collars is one of the most impressive steps in our manufacturing process. Every single thread from the collar and the body of the sweater is looped together on a specialized machine. The folks doing this work make it seem easy, but it’s not. It’s a skill of both dexterity and visual acumen, for if you miss even one loop it all has to be done over. St. Croix doesn’t have a selection of “seconds”—every garment is perfect along every step in the process or it doesn’t go out. The final inspection step ensures that every piece is perfect. We’ve all done it. We’ve seen something for a great price and impulsively bought it. You might love it at first. And it might even look good on the hanger, but it’s a whole different story when you put it on. Don’t even think about pushing the sleeves up, because soon they’ll grow and stretch, covering half your hands. Or maybe it holds up OK—until you wash it. Then all bets are off. It might shrink, fade, or simply become a misshapen, unusable lump. At that point, the great price you paid for it becomes far too expensive, because the garment was basically a one-time use. This is a problem in the industry and the world, not to mention your wallet. The next time you want to purchase something new for your wardrobe, we encourage you to pause and think about the real cost of what you’re buying. There’s nothing wrong with some frivolity in clothing…that’s what makes fashion fun. But do yourself a favor and build your wardrobe around solid pieces that stand the test of time. Our American-made, hand-crafted, fine luxury knitwear is the best value in fashion today—and tomorrow. And we’re proud of it.